“No museum, anywhere, has ever faced a restoration project of this magnitude,” Museum of Flight curator Dan Hagedorn says of the historic plane. TWO YEARS AGO, Museum of Flight curator Dan Hagedorn walked through the decaying fuselage of RA-001, the first Boeing 747, frowned and offered a frank assessment: “No museum, anywhere, has ever faced a restoration project of this magnitude,” he said, predicting a long, piecemeal rehab of the once-proud symbol of Seattle-area big thinking. A couple months later, retired Boeing quality-assurance manager Dennis Dhein gave the musty bird a similar walk-through, shrugged, banged out a to-do list, recruited some buddies, and got to work. 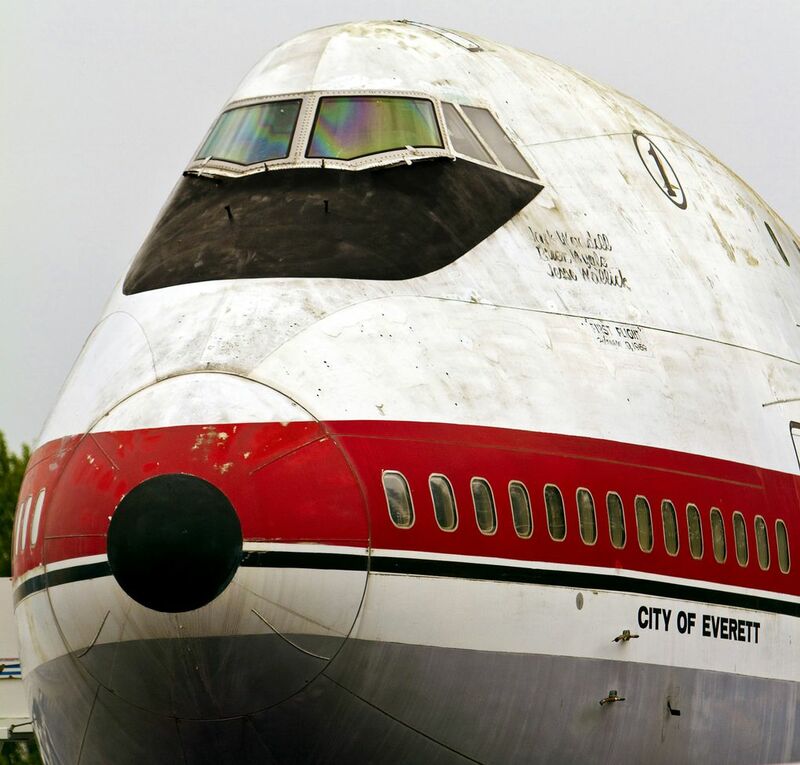 Today, the historic plane looks a lot closer to the gleaming beast that rolled from a hangar in Everett on Sept. 10, 1968, than a plane one step away from a desert bone yard. Leaky seams have been sealed, carpeting replaced, lighting installed and equipment restored to return the plane to its unique test-flight configuration. Even more significantly, the hulking aircraft, which sits among other historic jetliners outside the museum near Boeing Field, now gleams in its original white, red and silver test-plane livery, thanks to its first paint job in decades. “We have brought that beautiful airplane back from the brink,” Hagedorn says. He offers full credit to Dhein and a crew of mostly retired restorers who have thrown their collective hearts, as well as dogged, seat-of-the-pants ingenuity, into restoring the machine that put the Puget Sound region on the map as a center of innovation — and whose progeny have kept it there for more than four decades. The remarkable transformation of RA-001 from rust bucket to near-showpiece is a testament to the Puget Sound region’s vast reserve of accumulated aeronautical-engineering know-how. It also points to the equally vast pride of ownership of classic jetliners by former employees of the “old Boeing,” which built planes essentially from scratch, right here. In the late 1960s, the team of original 747 engineers, commanded by Seattle native and University of Washington grad Joe Sutter, became so legendary for the innovative design of the then-unthinkably huge plane they were nicknamed “The Incredibles.” Some of that same can-do spirit has been summoned to put the remarkable plane they built back together. This good news for the plane is about to get better: “Number One,” as it’s known to generations of locals, is finally about to come in out of the rain once and for all. The Museum of Flight is poised to break ground on a massive roof to cover the 747 and other classic planes, including B-17 and B-29 bombers, the first jet-powered Air Force One, the first 787 and a Concorde supersonic jet. 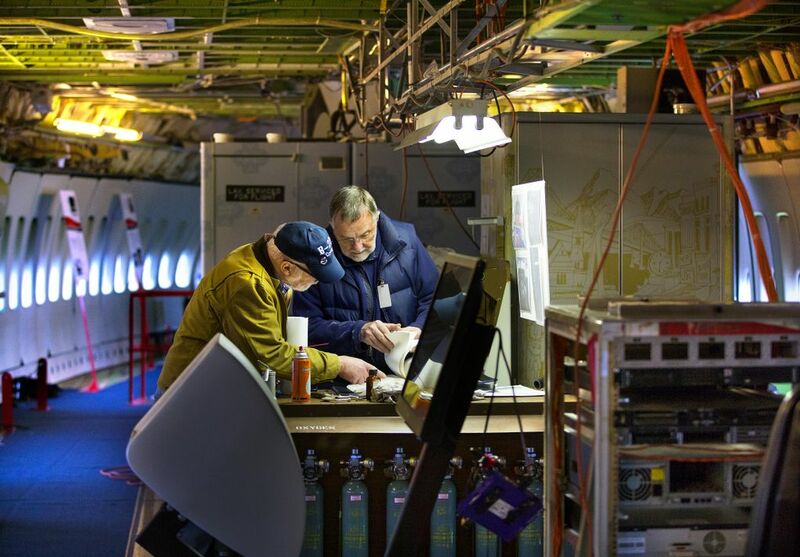 While that project unfolds over the next two years, it’s unclear how much access the volunteer crew will have to their now-beloved 747 — which remains very much a work in progress. But don’t be surprised if Dhein’s crew finds a way to get inside the plane at its temporary parking stall to keep chipping away at that to-do list. Volunteer restorers, on this plane and many others in the museum’s collection, tend to find a way. LOCAL AIRPLANE lovers have long lamented the decay of Number One, which made its last landing at Boeing Field on April 6, 1995. But getting enough of them, in the right places, to roll up their sleeves at the same time required a bit of serendipity. The museum’s long quest to acquire a retired Space Shuttle ended in 2011, when it instead was awarded by NASA a mock-up shuttle trainer, now a popular display. That freed the museum to refocus on protecting its exposed collection of vintage jetliners, lined up just outside the shuttle building’s doors. 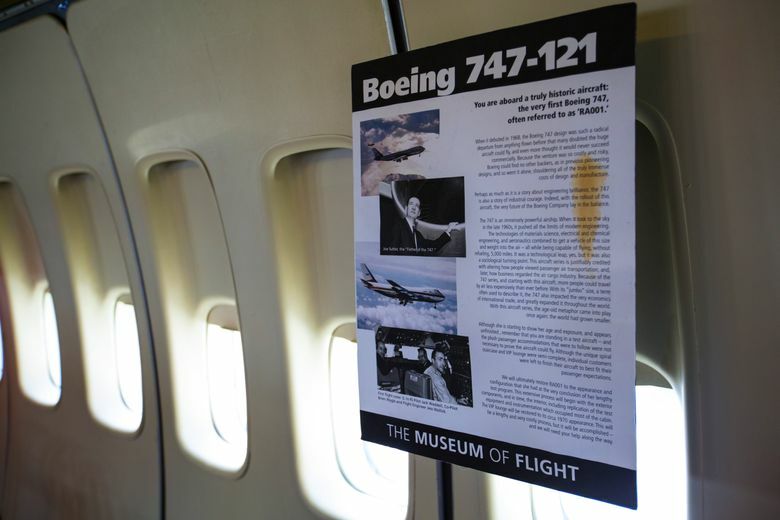 Months later, a September 2012 essay in Pacific NW magazine about the sad state of the plane lit a match beneath the museum and the local aviation-fan community, volunteer restorers say. 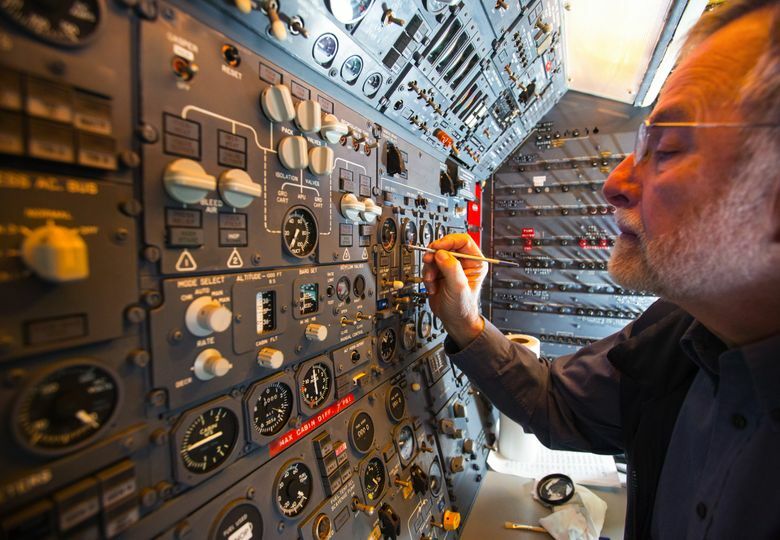 “When I saw that article, and they said they wanted volunteers, I said, ‘OK, that’s me,’ ” said retired Boeing engineer turned soiled-747-landing-gear restorer Ted Schumaker, 79. Alert volunteer coordinator Carol Thomson, who manages more than 500 “passionate and enthusiastic” museum volunteers, called a meeting of dislocated restorers and asked for volunteer crew chiefs to head up teams for the big airpark jets. Two others, Schumaker and Tom Elliott, immediately signed on. Volunteers Dale Thompson, Tom Olsson and a dozen others followed. In late 2012, the crew chief and his charges pried open the cabin door to the 231-foot-long piece of aviation history — and got an unpleasant dose of reality. The crew kept adding — and continues to add — to Dhein’s list, which lives on as a spreadsheet on his home computer. It has grown to 118 items, roughly 60 percent of which are complete to standards the crew considers acceptable. Many of these are big-ticket matters: Reinstalling electronic-equipment test racks in the main cabin. Cleaning the massive landing gear and replacing chest-high, threadbare tires. Finding lost pieces for engines and cowlings. Renovating landing lights. Replacing or repairing flooring and seals for hatches and doors. Other items might be considered minor, but still matter for historical accuracy: New sheepskin for the pilots’ seats. Refurbishing the trademark spiral staircase to the upper cabin. Reupholstering lounge seats in period-groovy early 1970s fabrics. Installing display lighting and replacing broken or lost gauges in the cockpit. Replacing crumbling cords on intercom handsets. On and on. Think of Number One the way the crew has come to see it — as a cherished, 47-year-old, three-story fixer-upper — one that had been abused mercilessly in a life span as a diverse test plane for future 747s, engine tests for future jetliners, and even a stint as an experimental jumbo refueling tanker. 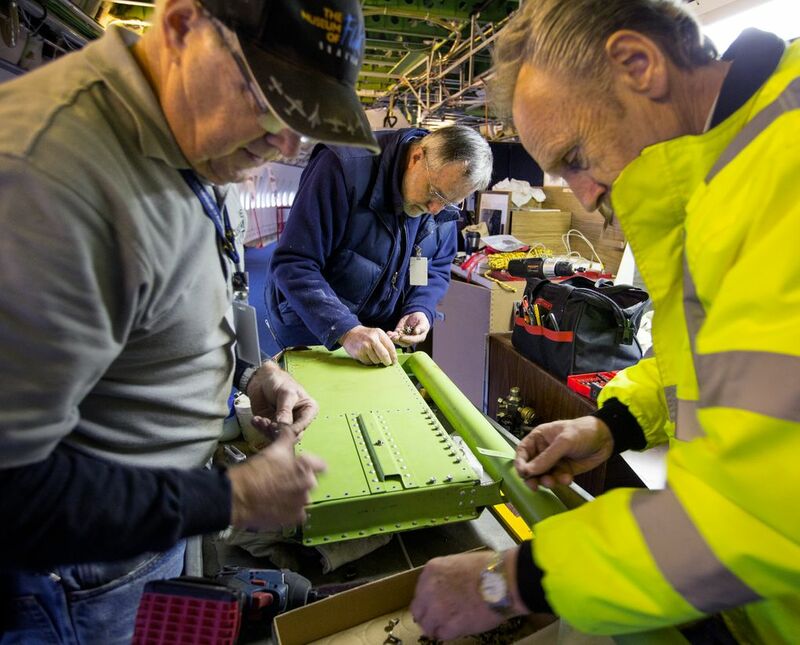 Many missing pieces have been donated by local airplane subcontractors and installed with savvy advice from past Boeing workers. Most of the easy repairs have been made. Now the crew is down to replacing parts that, if they can’t be located, will have to be refabricated to make the plane complete. “We’ve still got some really time-consuming stuff ahead of us,” Dhein says. THE PROBLEM, of course, is that you can’t make a call to O’Reilly Jumbo Jetliner Parts and order a missing 747-100 series lounge ceiling panel. It’s possible that part either never existed, or was removed at some point and lost. A test plane isn’t designed to look good — on the inside, at least. It’s pure functionality, and RA-001, the forerunner to the oft-posh “Queen of the Skies” long-range 747 family, reeks of that working-class ethic. 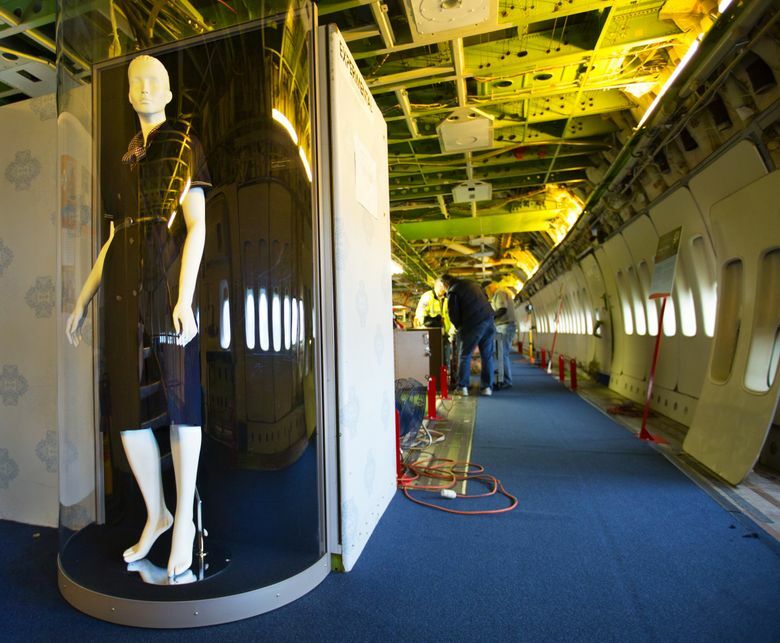 In fact, the plane’s stripped-down interior, with flight-control systems, electrical wiring and air ducts visible in uncovered ceilings and walls, is part of its museum-piece allure: It provides a near-cross-section view of an airplane that very few people have ever seen stripped of ceiling panels, bulkheads, luggage bins and other interior finery. But restoring the plane to that test-bed configuration — complete with racks of manned electronic gadgetry and water barrels for ballast — has presented its own challenges. 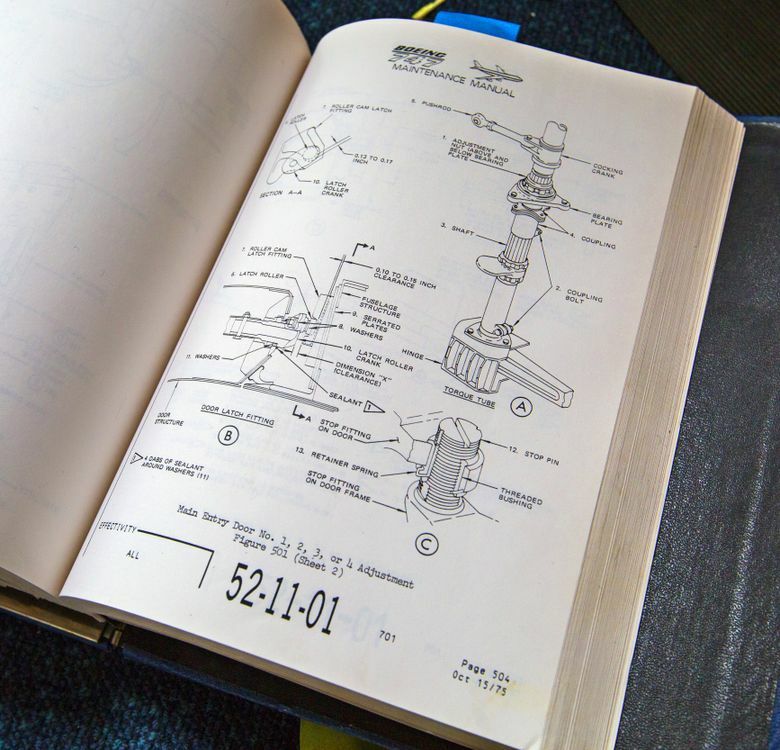 None of the original 75,000 design drawings created by Sutter’s team have been provided by Boeing; the 747, after some 1,500 planes delivered and nearly 6 billion passengers flown, is, for now still an active product line. For fine details, restorers have turned to old test-flight photographs to see how the main cabin was arranged. Some similar electronic gear has been found and reinstalled in test stations that at least look period-authentic. Did you work on 747 production in the early days? Or do you have vivid memories of the first time you saw the plane or boarded one? If so, please use the comment thread below to tell us about it. 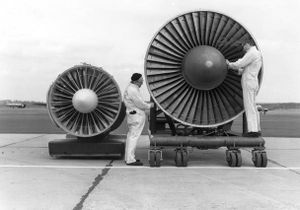 The greatest challenge has been finding exterior engine and engine-strut pieces for the plane’s four Pratt & Whitney JT-9D engines. 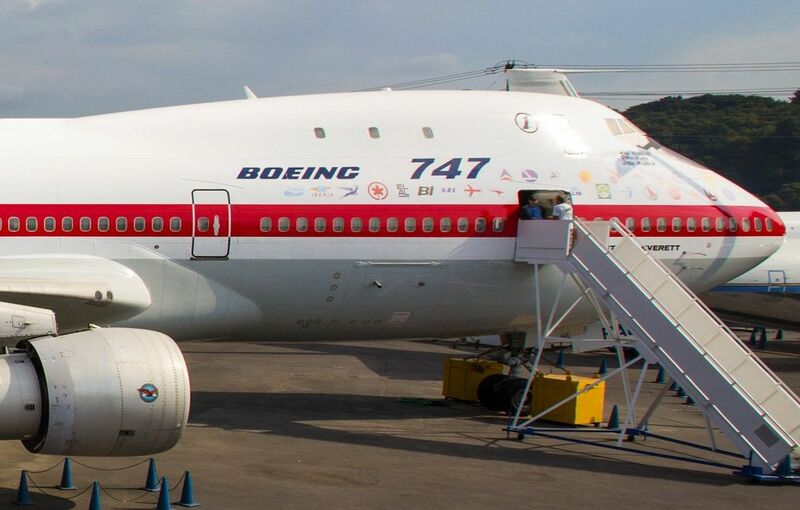 RA-001 not only is one of a kind, it also is among the last surviving 747-100s still in one piece. Most of the other 250 planes of its class, all built in Everett, have long since retired from service; most have been scrapped. Mining the network of global airplane salvage companies has become an ongoing adventure for Dhein, who worked for Boeing Commercial Airplanes for 27 years. Plenty of them existed for 747-400s, many of which still fly. But they’re a slightly different size. Dhein put out the word on the airplane-restorer and subcontractor wire. Dhein, not wanting the tires to get away, sprung for the $600 shipping cost himself. The team now has accumulated 15 tires — almost enough for new rubber all around. Installation will wait until the plane is permanently settled under the new museum airpark roof, at which point old Number One will roll to a final, dignified stop. THAT ROOF might prove to be the plane’s salvation. 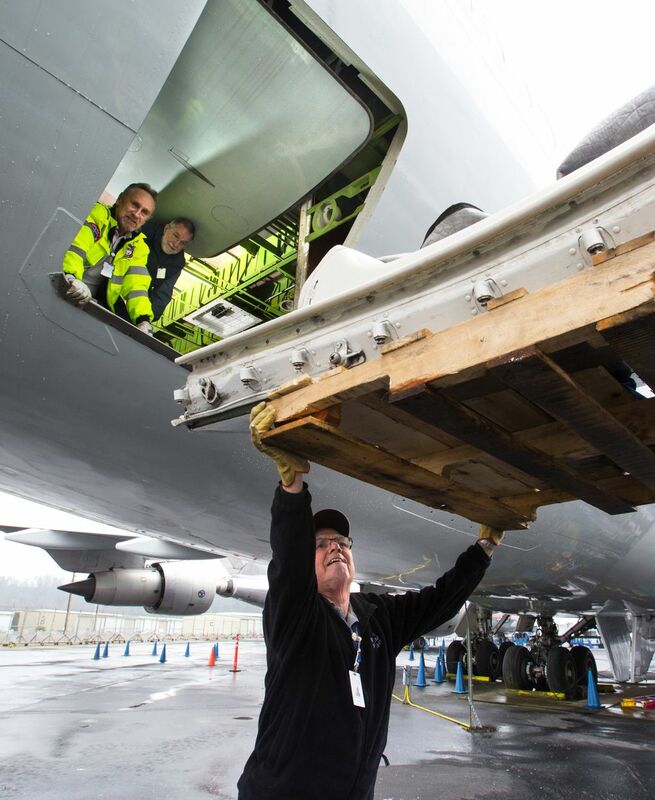 Much of the completed repair work would be for naught if the 747, its old, riveted aluminum shell a magnet for seepage, remained exposed to the Seattle rain. Even after all the seams they’ve sealed, crew members continue to play Whac-A-Mole with leaks. Not for long. The airpark roof project, which will span the space between the museum’s Charles Simonyi Space Gallery and Aviation High School to the north, is scheduled to be complete sometime next year. And Number One will be displayed beneath it with a new, gleaming exterior, thanks to a unique paint job completed last summer on-site by Global Jet Painting of Ojai, Calif. 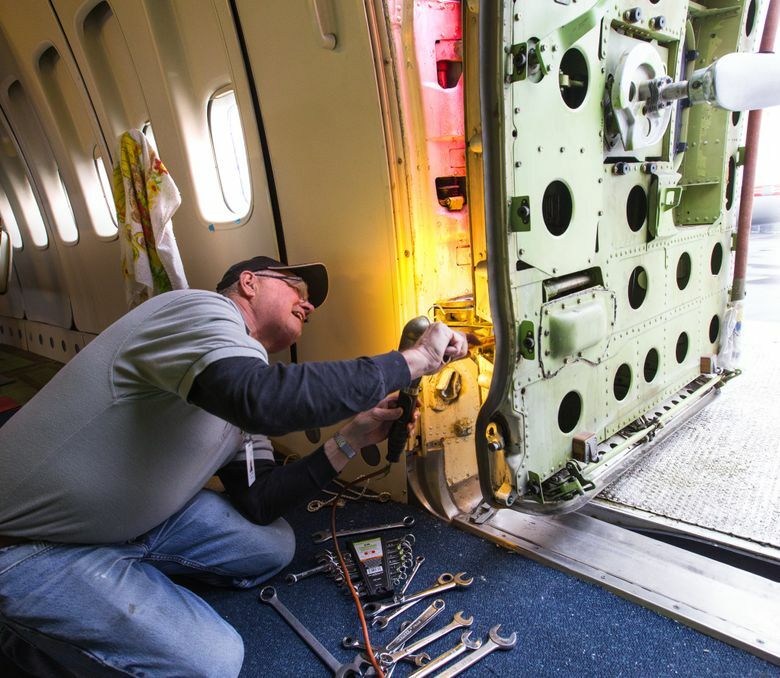 The company, more accustomed to painting jetliners privately owned by rich people, was one of few equipped for this unusual job — repainting a jumbo jet outside, with foam rollers instead of spray equipment. Its crew, Dhein said, quickly embraced his own workers’ passion for the plane, putting extra effort and pride into a job they knew would be for posterity. The result is striking; the plane appears much as it did when it first rolled out of the Everett plant 47 years ago. “The first morning after they’d finished, I walked out of the building and I swear to God the airplane looked like she was standing taller,” Hagedorn recalls. When the roof is complete, visitors will be able to climb the steps into a piece of aviation history: The plane many credit with “democratizing” global travel, looking very much like it did when pilot Jack Waddell, co-pilot Brien Wygle and flight engineer Jesse Wallick first guided it into flight at Paine Field on Feb. 9, 1969. Most visitors won’t get to the flight deck, because the spiral staircase, even restored, won’t handle the museum’s half-million annual visitors. But the refurbished plane is likely to be a museum draw for decades, showing, among other things, how rapidly technology has advanced since that first flight. During limited public openings last year, Dhein and his friends got a glimpse into the plane’s future: Scores of visitors, ranging from international tourists to Boeing employees who worked on the Everett production line, were “tickled pink,” Dhein says, to be able to finally stroll through the plane that revolutionized modern air travel. Among the most visibly moved were former pilots and line workers from the 747 program. Like its original builders, the small, dedicated crew still working to make the plane a showpiece is a testament to the Puget Sound region’s still-active love affair with making big machines fly, Hagedorn believes. Ron Judd is a Pacific NW magazine writer. Reach him at rjudd@seattletimes.com or 206-464-8280. On Twitter @roncjudd. Mike Siegel is a Seattle Times staff photographer.